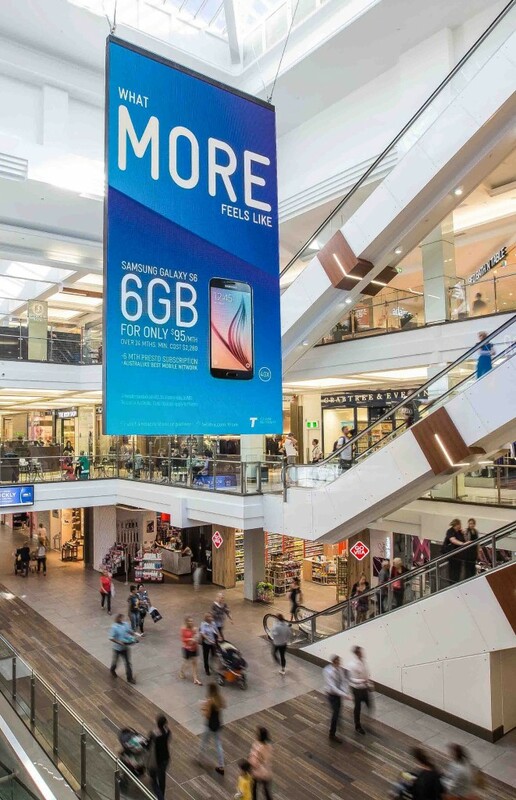 Godridge and her mall management team at Indooroopilly Business Partnerships (IBP) understood the revenue generating potential of a large state-of-the-art visualization solution that could be hung in the center of the three-story atrium area. IBP’s mission is to create exciting opportunities for the centre’s retail partners to communicate their sales message in ways that generate immediate feedback. The team strives to provide its partners with distinct advertising and marketing programs that influence their purchase path while they’re in the mall. “The design of the Indooroopily Shopping Centre runs along straight lines, which means that the right visualization solution can be seen from virtually every angle of approach by every shopper in the mall,” Godridge explained. “We worked with Digital Place Solutions to create a design that would absolutely galvanize the attention of shoppers, thus providing us with an advertising medium that would help our retail partners to communicate directly with their customers, no matter where they were in the mall.” The outcome was the largest suspended double sided LED banner in any Queensland retail centre, high impact and high resolution. As the principles of Australia’s leading digital display and place based media consultancy, Stephen Rubie and Gerry Thorley are deeply experienced in helping proactive clients to gain a competitive edge through the design of customer engagement solutions that stand out from the crowd of traditional “digital signage.” “We knew from the start that only NanoLumens could imagine and execute a compelling, revenue-generating solution that was also cost-effective, space-efficient and eco-friendly,” Rubie explained. That solution, according to Rubie, now hangs suspended in the center of the massive atrium area located in the northern end of the mall, just outside the main anchor stores of Myer Department Store, Coles, and Woolworths (FMCG Supermarkets). “The NanoLumens solution is an absolute show-stopper,” Rubie emphasized. “The IBP team was challenged with a large atrium space and a very limited weight capacity loading in the ceiling to hang a display. The NanoLumens visualization solution provides the perfect mix of high resolution, high impact LED display with a very light weight and ultra-slim profile to meet the aesthetic objectives of the mall. The 6mm pixel pitch double-sided digital banner measures 7mH X 4mW and is only 160mm thick, weighs less than 1700 kgs and draws less than 7 amps in power consumption. The NanoLumens solution was recommended by Digital Place Solutions. The displays were installed by AV systems integrator Digi Corporate.